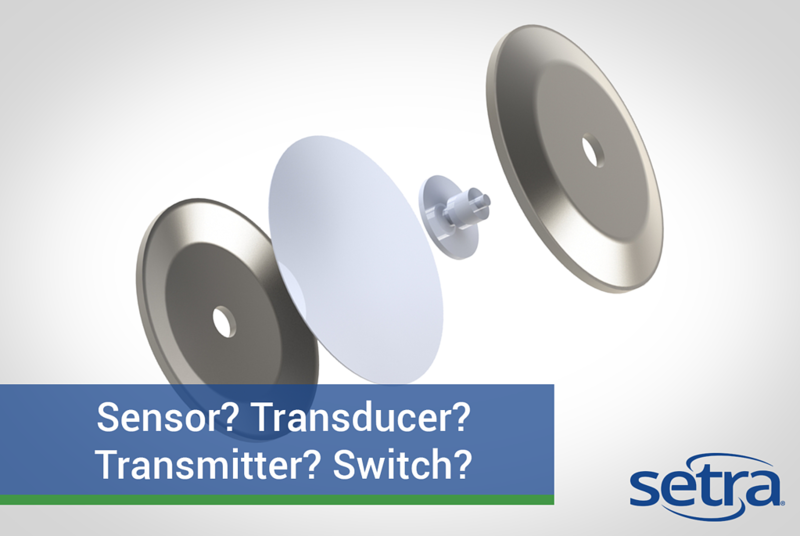 What is the difference between a pressure sensor, transducer, transmitter, and switch? Pressure transmitter? Pressure transducer? Pressure sensor? Pressure switch? What are they and how are they different from each other? There are many different types of devices in the pressure sensing industry, the names of which can be confusing to the uninitiated. All of these terms are specific to variable capacitive sensing technologies, which is the detection and measurement of fluid pressure through the change in voltage across a capacitor. This pressure sensing technology is extremely accurate, going as low as ±0.07% of full scale. Variable capacitance technology is used on applications where a high degree of accuracy is paramount, such as engine test stands and pressure decay leak detection. A pressure sensor is any device that measures pressure and converts it to an electrical signal. It’s an all-encompassing term that includes pressure transducers, transmitters, and switches (these will be defined below). All transducers, transmitters, and switches are sensors, but not all sensors are transducers, transmitters, or switches. Pressure transducers and pressure transmitters are very similar. A pressure transducer is an electromechanical device for translating pressure values into voltages across a high-impedance load (5,000 ohms or greater). A transmitter on the other hand translates pressure values into currents (generally 4-20 mA) across a low-impedance load. In general, transmitters are preferred when sending a signal over relatively long distances (i.e. over thousands of feet). Neither of which, however, can change or control pressure. These devices are solely for measuring pressure and communicating the output electronically or visually. BLOG: How to convert mA into voltage. Unlike a transducer or transmitter that can translate all of the pressures in its range, a pressure switch will trigger at a specific set pressure. That set pressure can either be high or low and can either engage or disengage a circuit. These are commonly found in vehicles to indicate low engine oil pressure and in gas compressors with an automatic shut-off mechanism. CLICK HERE to learn why HVAC systems need pressure sensors.